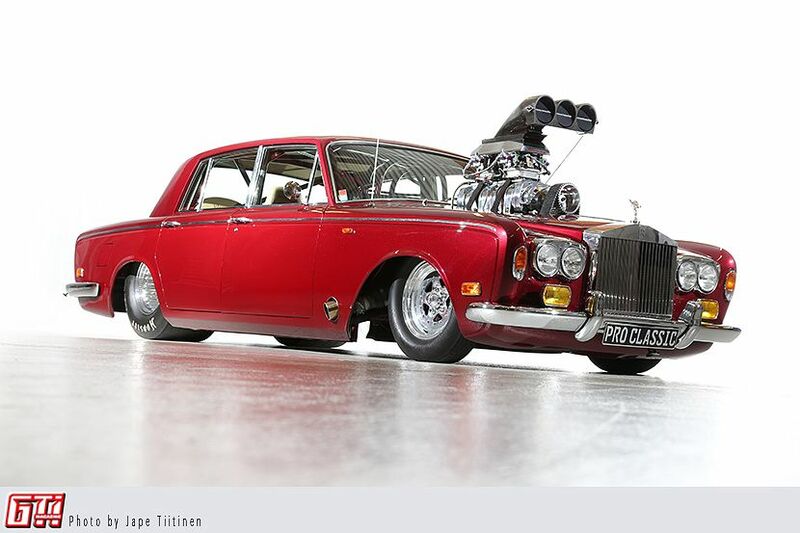 A 1974 Rolls Royce Silver Shadow is a perfect project for a drag car, said no one ever. That was before two men from Kurikka stepped in and needed a new victim for their insane ideas. 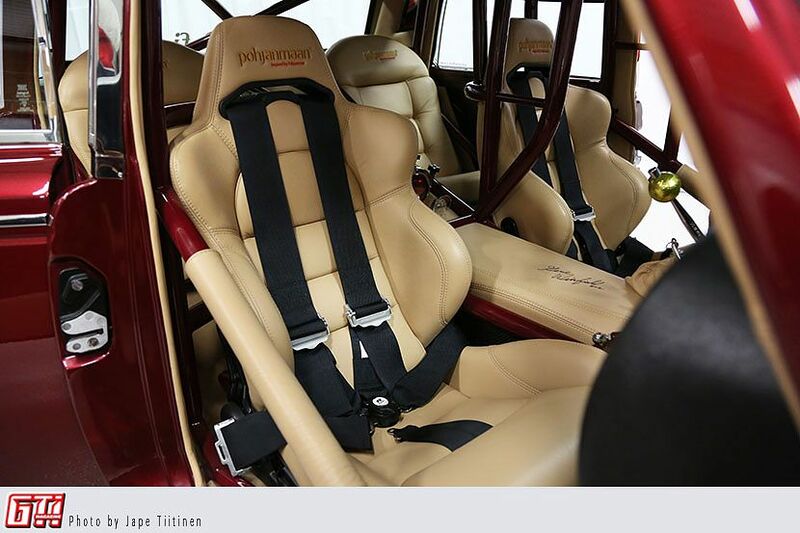 Madness, imagination, good sense of humor and professional craftmanship can get you pretty far. 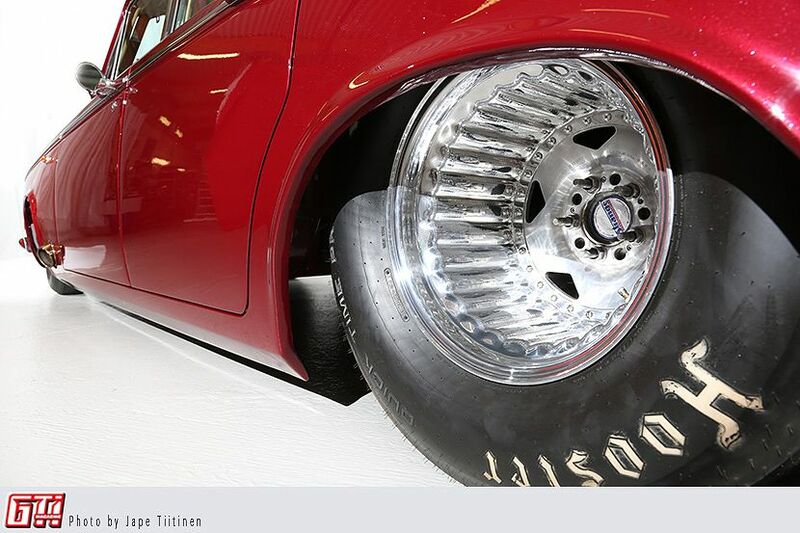 The idea to tune a Rolls was born in 2008, when Petri Plosila's friend visited SEMA Show in Vegas and brought back some inspiring photos. Apparently there was a fully built Silver Shadow on display, and almost instantly the search for a similar car begun. These cars are very rare in Finland, so it took some time to find a decent specimen. 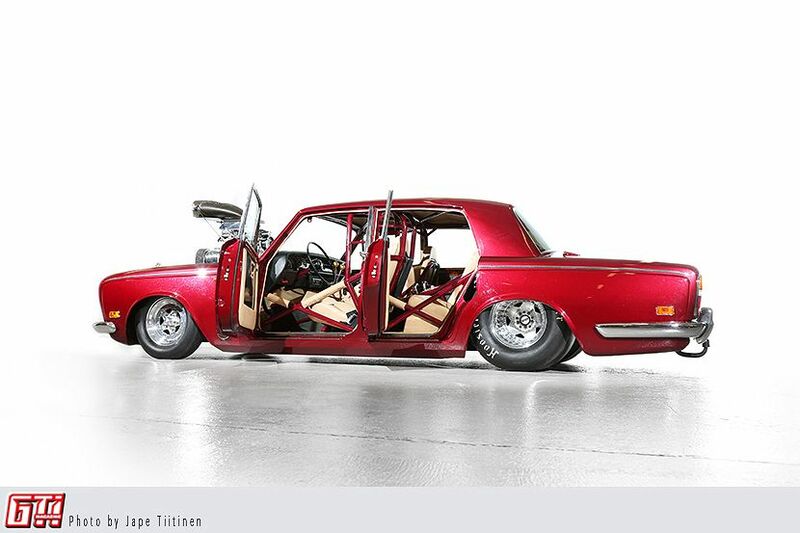 In 2010 a Silver Shadow was bought, but Petri and Raine Savioja started to doubt their own insanity, and sold the car. 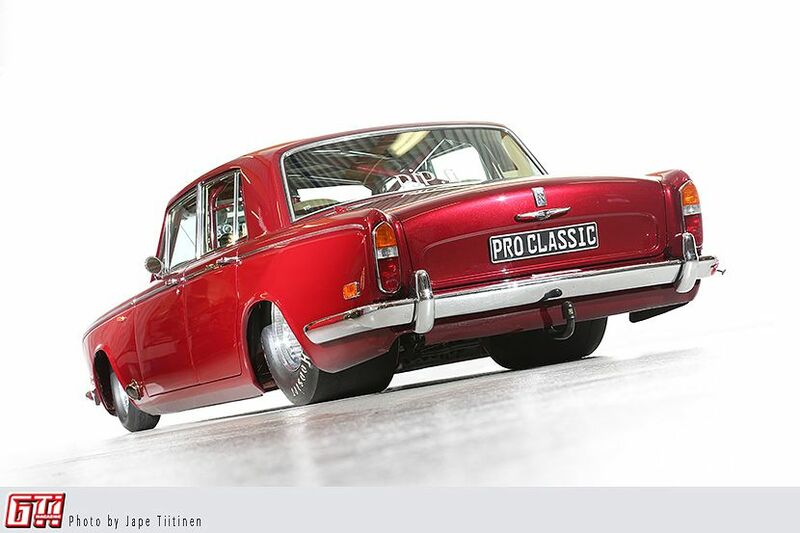 A new Silver Shadow was bought just a few months later, when the guys regained their madness. Why do I keep repeating that the guys are insane? Because they are known as guys who have built some of the most outrageous things nationwide (ever heard of Tunabusa?). Lots of rollcage, eh? 123 meters of chrome moly pipe has been used in creating this chassis, and it is a legit Pro Modified double tube chassis contraption. Everything has been built from scratch, from axles to suspension and back. The stock engine didn't convince Raine and Petri. A few ears ago the guys had built a Skoda 120L that ran high 9's on the quarter mile, and the engine was ready to receive a new home. This Oldsmobile 462cid V8 was equipped with a Mooneyham 14/71 Full Teflon -charger, so it was a perfect match for this heavyweight princess of a car. The Rolls is fast, as is hinted by the width of the rear tires. 1/8 mile was run at 6.5 seconds at 180km/h speed. This just might be the fastest luxury car in this country of ours. The build quality is enough for a Saudi prince, which is kind of a running theme here.. The car runs with ethanol, as do the owners. 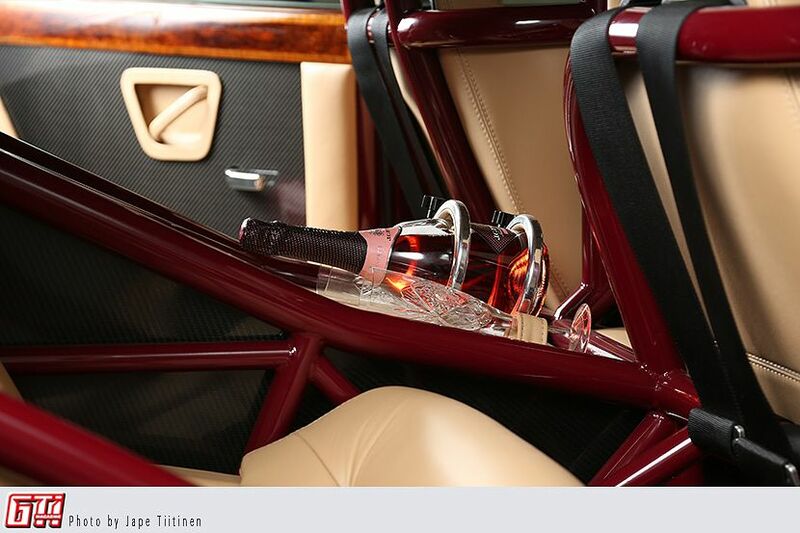 You normally don't see rear seats in a drag car, but the owners are keen on sitting in the back drinking champagne when the lights turn green. It's a CEO level car, anyway, so why drive the car yourself? Stock weight is about 2250 kg, so the car was put on a diet. Now it weighs roughly 1000 kilos less. About 50kg was lost when the car's own paintjob was removed. The list of remaining stock parts is pretty short: body panels, instrument panel and steering wheel. And of those the steering wheel has been modified to have a quick-release lock. Stock wiring was used when it was proven reliable, which was never. In other words, every necessary wire is brand new. 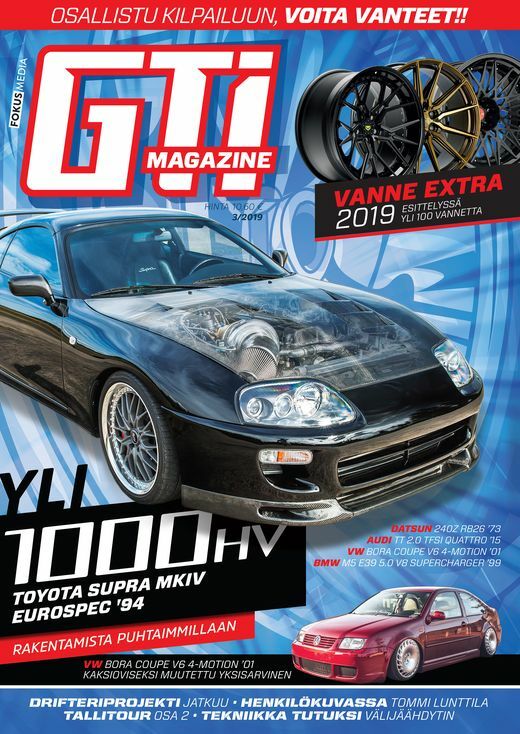 Pohjanmaan OY / Automaalaus Pasi Seppänen / PHP Ky / Coda väri / Karhukiilloitus OYJ, Fennia, Suomen Automaalikeskus, Timo Viitala, Sami Teini, Tapio Nevala, Jukka Mattila, Pasi Seppänen, Petri Ritola, Jarkko Kankaanpää, Timo Koivunen, Tero Koskela, Sami Rinta-Hirvelä, Sami Toppari, MAT, Esa Takala, Panu Plosila, Heikki Plosila, Juha Mäki-Saari, Janne Tuominen, Jari Kujala.